Sometimes it’s hard to accept that when you’re living with a chronic illness, people fall away, but it is something that commonly happens after a period of time, and it might even be beneficial. Initially, once people are made aware of your struggles, you might have an outpouring of support and practical help from many around you, but over time, when you don’t improve, most people will inevitably drift away as they are unable to make taking care of you a permanent fixture in their lives. They have their own lives to navigate. When you’re no longer in the same circles, no longer going out, no longer socialising, you’re no longer in their life unless an effort is consciously made on both sides to stay in touch and make things happen. I have seen this happen over and over again with so many people who fall ill. That’s why I don’t believe you should take it personally, it’s just a fact of life – only a precious few will remain, if you’re lucky. Some people are only meant to be in your life for a season. It takes a very special kind of person who is strong enough, emotionally fit enough, to support such a long term commitment, like taking care of your needs when you’re unable. Not because they don’t love you or can’t be bothered to deal with it, though in some cases this is unfortunately true, I believe that in most cases though, it is simply too hard to watch somebody you care for suffer while you look on, feeling utterly useless. Treasure those few souls who have stuck by you through it all. They do it not out of pity or obligation, but because they love you despite your condition. Many chronically ill people push others away, they think they’re a burden and that others resent them. Unless you’re suffering abuse from those who are taking care of you, they’re probably doing it gladly out of love. You’re still you and they wouldn’t want to be anywhere else. Don’t push them away! Most healthy people don’t know how to deal with chronic illness, they don’t know what’s appropriate to say or do. It puts them way outside of their comfort zone – and people tend to avoid things that bring them discomfort. It’s easy to say, “Yes, it’s uncomfortable for you, but I have to deal with this 24/7. Imagine how I feel”, but the reality is that nobody chose this, and few would willingly submit themselves to it unless you are a spouse or very close relative and even then it is not always guaranteed that they will feel comfortable around you. This is not your fault, humans fear and avoid things they don’t understand. In most instances of chronic illness I believe that they won’t get it unless they’ve got it. 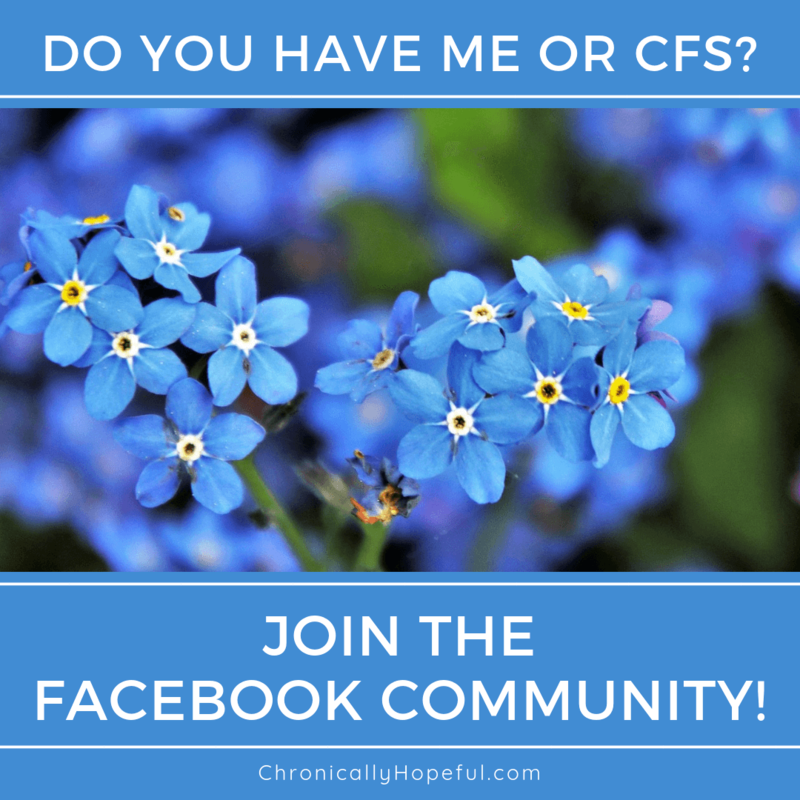 I know I would never have understood ME/CFS if I hadn’t got it myself. I could never even imagine the depths of pain and exhaustion that are possible and I know there are others much more severe than myself! If I had never experienced utter inability to function, light and noise sensitivity that causes shooting pains through my body and Superman’s sense of smell, I’d never have understood it, so I know that I owe healthy people the benefit of the doubt when they make inappropriate comments or drift away from my life. Perhaps it is even a good thing that only those precious few who truly understand and support me remain? I trust that the Lord can bring people into your life who need to be there and remove those who shouldn’t. This doesn’t mean that everybody in your life should be there, if a relationship is abusive, toxic or clearly goes against the Lord’s will, then perhaps He’s waiting for you to accept that and take action. Submitting to His will. Not only do those toxic relationships hinder your walk, but they will cause a cascade of negative effects on your health. As anybody with chronic pain or chronic fatigue knows; negativity, stress, anxiety, anger, fear and heartbreak only make the pain and fatigue worse. Not to mention all the other symptoms that increase in intensity upon emotional exertion of any sort! I have gone through this process a few times now, letting go of people for various reasons. Whether they drifted away or whether I had to send them on their way, it was never easy. It’s often an extremely heart-wrenching process, but once you make peace with the fact that their season has passed, that people have their own lives to deal with and most cannot commit to carrying your burdens with you, when you realise that their troubles aren’t lesser than yours, they’re just different. Once you accept that people will leave – and that it’s okay, you’ll be okay, when you fully grasp just how much God loves you (and them) and is able to sustain both parties apart from each other, that is when you find comfort, relief and peace. We all have our purpose. All those people who we thought were there for us, but now that we need them have vanished: their season has passed. If they were willing and able to walk the next part of this journey with you, then I’m sure they’d still be around. Some people, although they might care for you, are just not equipped to deal with certain things. Trust that the Lord will bring you into contact with the right kind of people at the right time and until then, just keep trusting in His love, presence and provision. He is faithful. Do you have supportive friends and family? Have people continued to visit or help you through the duration of your illness? Have you found that you are left with just a few really good friends and everybody else has drifted away? You are not alone! If you need to talk or connect with others who understand what you’re going through, please get in touch. I’d love to hear from you. Leave a comment below or contact me privately. Isn’t it strange how that works? I had the same experience – the friends who I was certain would be with me through thick and thin, they are the ones that fell away first. I have 2 friends that still contact me weekly, one daily, to just check it. I think people don’t know how to be around us. They don’t realise that we don’t need much, a simple hello, or just share something of your day would be fine. To know you think of us or care that we are okay. But maybe those people were never really as true and close as we thought they were.